According to the Quran, both evolutionists and young-earth creationists have it wrong. 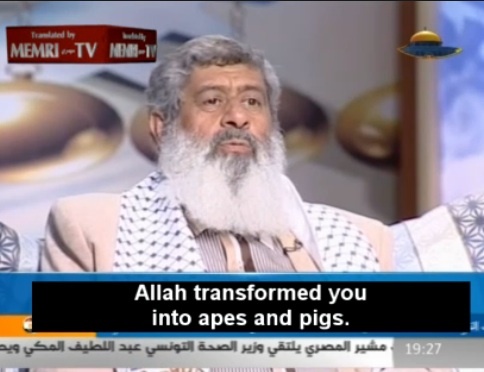 In reality, Allah got pissed at some Jews who were breaking the sabbath and cursed them by turning them into apes. He went even further by cursing all succeeding generations, which is why when apes have babies, they have ape babies instead of human babies. If Allah’s really pissed, he might turn you into a pig instead. This entry was posted in Atheism and tagged Absurdities in the Quran, Allah, Atheism, God, Islam, Quran, Quran Absurdities, Religion, The Prophet Muhammad, the Quran. Bookmark the permalink.